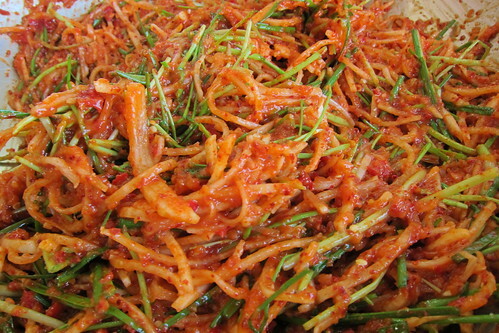 Bossam, a Korean dish traditionally served on kimchi-making day. Pickling is a hot trend these days, and plenty of cuisines have traditionally featured some form of pickled food, but few cultures revere pickling the way Koreans do. There's a Korean saying, chef EJ Jeong tells us, that roughly translates to: you can live without your wife but not without kimchi. That's some serious cultural weight for pickled cabbage. 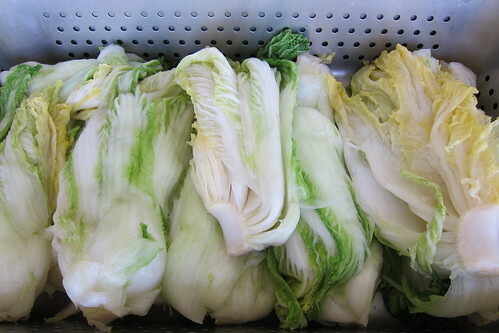 Another saying: you have to kill Napa cabbage seven times to make proper kimchi. 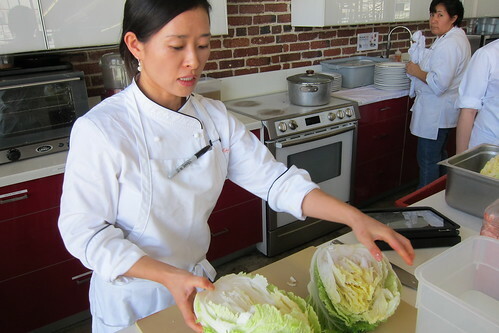 On Saturday, November 20th, chef Jeong of Cham Korean Bistro (which makes one of Jonathan Gold's fave versions of dolsot bibimbap) will show people how to do just that, hosting a kimchi-making demo at the restaurant's R&D kitchen near Vernon. (Details at the end of the post.) 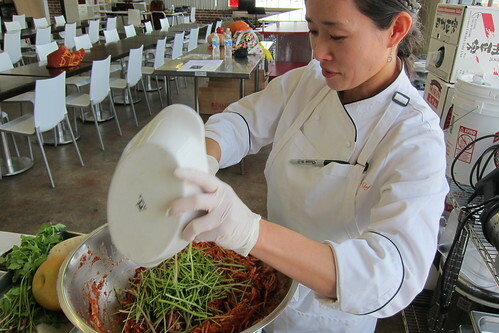 We got a preview of her pickling technique -- and a taste of her kimchi. 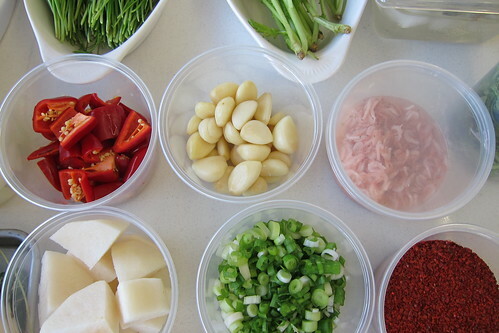 Cut and prep all your basic ingredients: chile peppers, garlic, very small dried shrimps, Asian pears, green onions and chile powder. 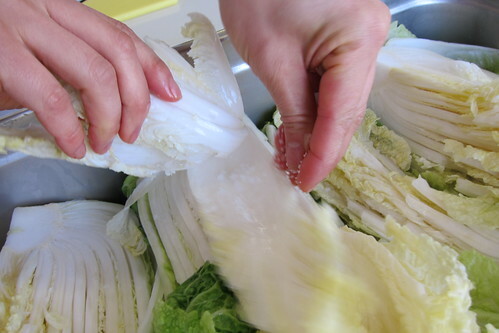 Spread sea salt between the cabbage leaves. Jeong says it needs to be mineral-rich sea salt because it "has naturalness level of flavor and it helps with preservation." Let the salted cabbage sit for 6-12 hours (no more than 16 hours), which allows the salt to soak in and the water to drain out. During this process, rotate the cabbage every two hours by placing the bunches at the bottom of the pile on top. When you do this, always keep the cut side up, so it retains water. When you're done, rinse the cabbage at least three times in the sink to get rid of the salt. 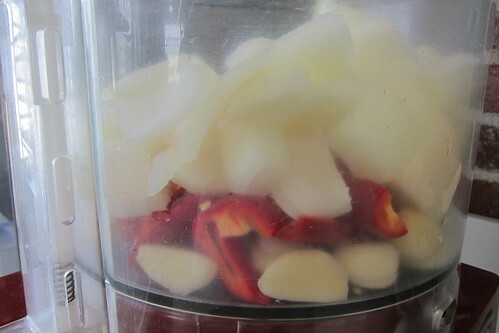 Throw the garlic, chile peppers, pears and onions in food processor, and chop it very fine. 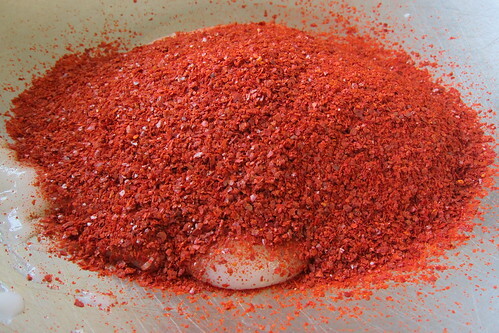 In a large bowl, mix the rice porridge and chile powder. 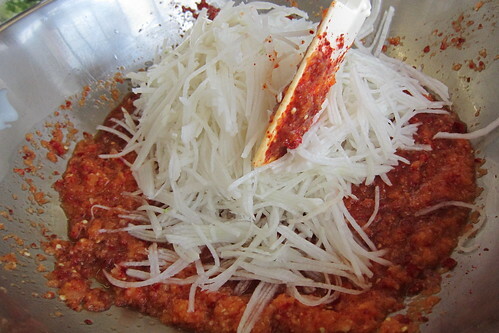 Add the concoction from the food processor to the rice porridge and chile powder, and stir them together. Add the sliced radishes and stir together. Add the minari, chives, green onions and cut veggies and stir together. Add the shrimp sauce and fish sauce. Add the dried shrimp and fresh shrimp. Mix it all together. "The protein so important," Jeong says, "because when it meets with all other ingredients it sparks fermentation, and the fresh shrimp gives it a deeper flavor." The results should look something like this. 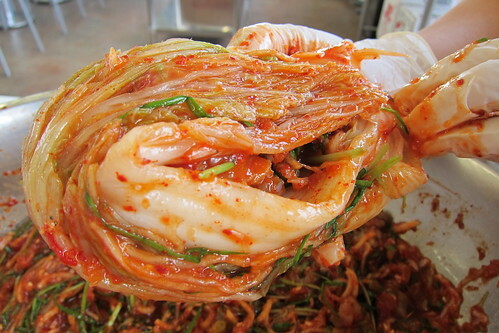 Rub the kimchi between the leaves of the Napa cabbage, and roll the cabbage into a ball. Put in your storage vessel. Clay jars are traditional and Jeong considers them the best, but glass jars and plastic containers are the modern equivalent and work just fine. 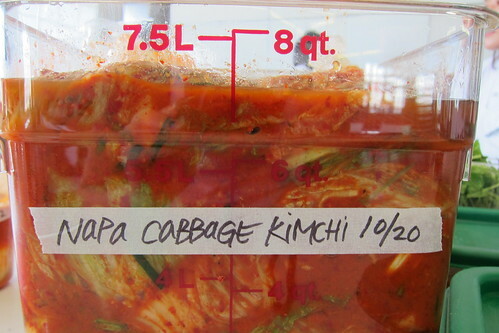 Make sure to leave room in the container, because the kimchi will expand as it ferments. 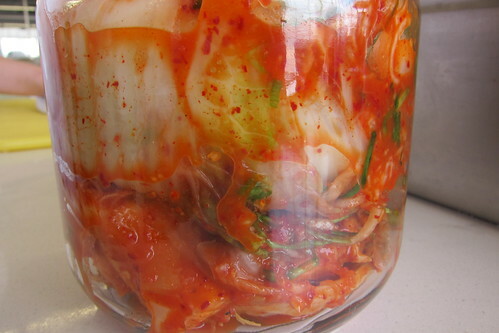 How long you allow your kimchi to ferment depends on what kind of effect you're trying to achieve. Jeong says the best flavor happens at low temperatures temp and after a long period of time (say like two weeks). 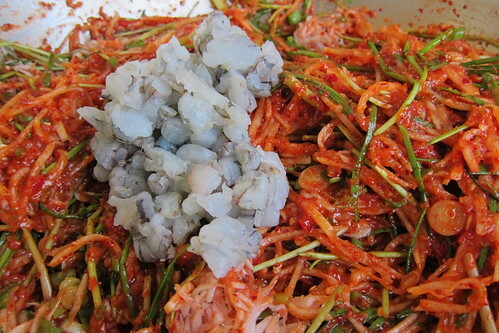 The longer you allow kimchi to ferment, the more pungent it generally gets. If you ferment it outdoors first, you're fermenting it at a higher temperature so it will ferment faster, but if you ferment it at lower temperatures, you will achieve a better flavor. Trim the cabbage by removing any brown leaves on the outer layers. Slice the middle of the bottom stem about 2 inches deep. Put your thumbs in the slit and pull it apart to divide it into two. Soak all cabbage leaves in salted water(16 c water and half of salt) for about 20min. 20 min later, sprinkle the other half of the salt between each of the thick part of the leaves. Cut side of cabbage should face up while wilting in salted water. You need to rotate the cabbages in the bottom part to the top part every 2 hours. It will take 5-6 hours. When it is ready, wash 3 times. Please be gentle and tender. Mix purified water with sweet rice powder, dissolving the powder until there are no lumps. Heat the water and rice powder mixture over the stovetop, stirring occasionally to prevent it from sticking to the bottom of the pot. When it starts to form bubbles, reduce the heat and stir continuously. Once the mixture becomes thicker and is translucent, turn the heat off. The process from once the mixture is heated to when it becomes the correct consistency and color takes approximately ten minutes. Cool down completely. Put onion, pear, garlic, fresno and garlic in food processor, running the machine until they are minced. Add the produce to the porridge and along with the remaining ingredients, adding the shrimp sauce and anchovy sauce last. Mix together. WHERE: Cham Bistro R&D Kitchen: 5251 S. Santa Fe Avenue, Los Angeles, CA 90058. COST: $40/person. Includes Korean tapas, a cocktail and the kimchi you make to take home. RSVP: Email kimchievent@chamkoreanbistro.com. Space is limited to 20 people. First come, first served.